Cleveland Heights High School, a historic 1926 Beaux-Arts school serving the Cleveland Heights and University Heights communities in Ohio, recently underwent a major renovation that included 235,000 square feet of new space. Designed by BSHM Architects, the LEED Gold Certified facility brings new life to the school while accentuating the building’s original and historic character. While some of the new spaces showcase more modern details - such as the gymnasium, aquatic facility and music areas - areas of the addition closest to the original building were designed to reflect the school's historic architectural proportions and materials, creating a more pleasing transition while allowing the designers to bring a fresh look to the exterior. In the new spaces, there was a focus on natural light, with Guardian 275® translucent panel daylighting systems used to add diffuse and energy-saving daylight. 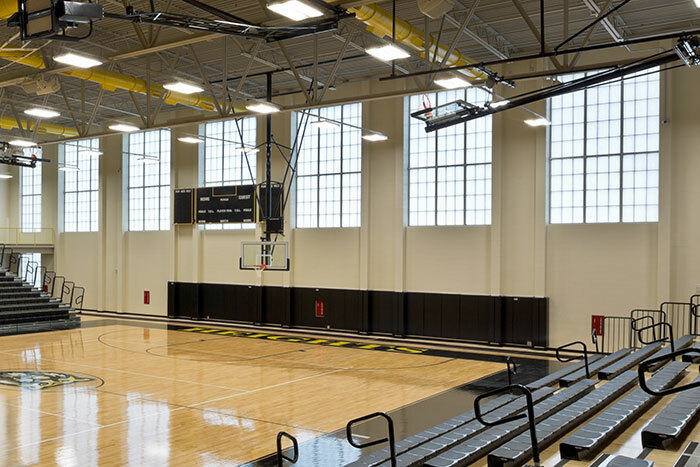 In the gymnasium, shown above, translucent panel wall systems bring natural light into the space without annoying glare that can be harmful to athletes and students. Large sections of wall panels can also dramatically reduce the need for artificial lighting during daylight hours. A translucent skylight was also used in the music area to bring in needed daylight and create some drama in the space, giving it a bright and open feel. For more information on this project, check out the BSHM website, and for more on Guardian 275® and our other translucent panel daylighting options, visit www.majorskylights.com.